After my MasterChef journey came to the end, we thought it would be fitting to eat at my favourite restaurant in Manchester. Adam Reid at The French. Adam has been picking up many well deserved accolades for his exceptional cooking. His philosophy is straight forward, taking inspiration from the local area and local produce. I guess after Friday night I can now officially call myself a good cook. Here I was in the hands of a great chef. The difference is enormous. Adam is cooking food of the highest order. You won’t be blown away by every course. 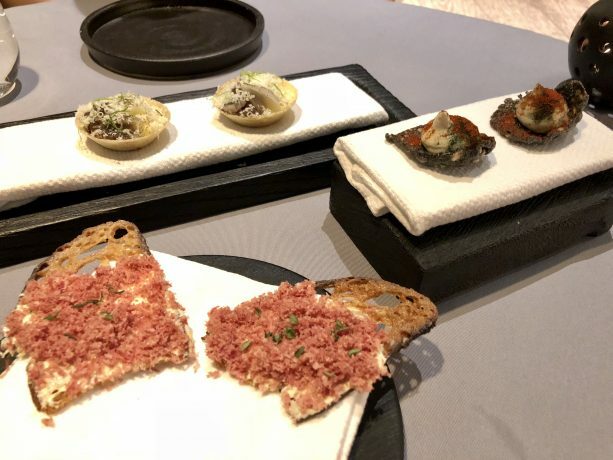 That is the nature of a taster menu. You will be tasting some of the best food you have ever had though. I for one, certainly did, and it wasn’t the dishes I was expecting. Well done Adam. Keep up the good work. Amuse Bouches to start, from back left. Lancashire tasty, onion and eel pie. A delicate little morsel of pickled onions, eel and a creamy cheese filling. To be honest, I can’t remember a better pie ever. Whipped cods roe, squid ink cracker. Textures were perfect with some paprika warmth over the roe. A little salty for my liking though. Dripping toast with grated tongue. Not everyones favourite ingredient, but the ferritin taste of the tongue was perfectly offset with creamy spread. 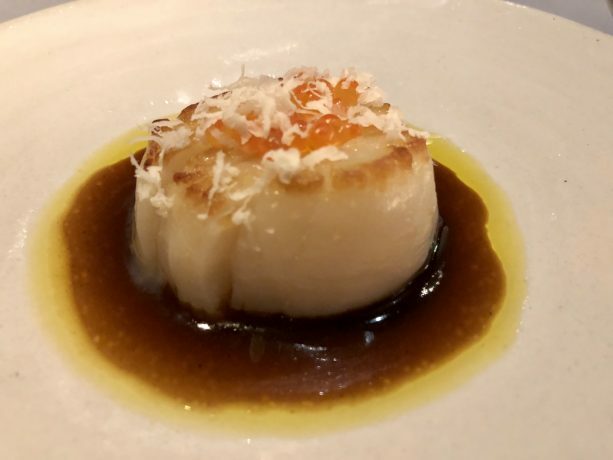 The scallop was delicious and sweet, paired with roasted onion broth. There was a strong fishy aftertaste to the sauce though, not overpowering, but an unwelcome addition in my humble opinion. Tater ash was up next. Wow. This blew our minds. Tater ash is just slang terminology for a potato hash, traditionally made on Mondays using up Sunday lunches leftovers. 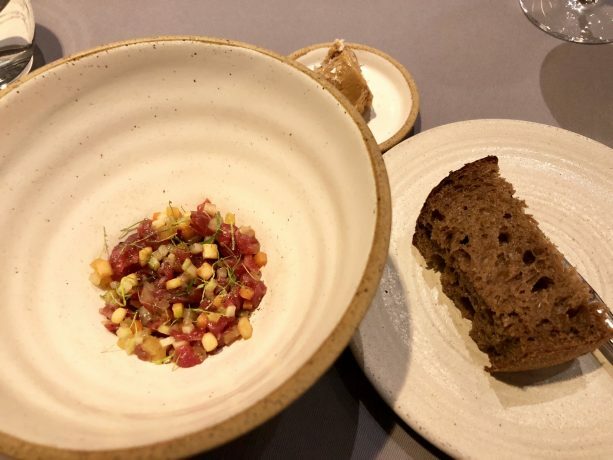 This came as a beef tartare with potatoes and all sorts of the finest diced vegetables you could imagine. The mushroom catsup butter was out of this world, spread on an ale bread. Unbelievable. It just goes to prove that the simplest things in life done well can be the best. This was probably my dish of the night. Very unassuming. A broccoli puree topped with Tunworth cheese and potato foam, with rice crispies made from potato! Mind blown. There was a hearty shaving of truffle on top and a herb oil. There was some offal in the mix too, but it was completely lost by everything else. This really was outstanding. 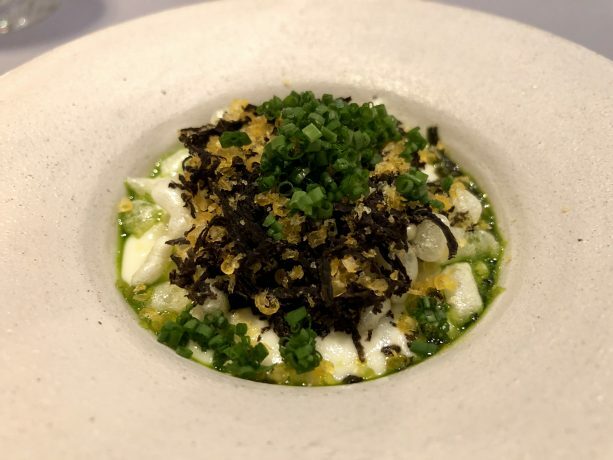 Although truffle is expensive and makes everything taste great, the shear brilliance of the other elements make this dish stand alone. The dish I was looking forward to the most. I love great flatfish like brill, turbot and halibut. To then add the best ingredient in the world, morel mushrooms, how excited was I? It was lovely, it just didn’t set my heart on fire. I feel the fish lacked a little seasoning and the sauce just lacking a depth of flavour too. Really nice, but I wanted this to be the best thing on the menu. There is a crazy amount of work that goes into this dish. The ducks are aged for two weeks, one week in a salt chamber. The legs are confited, served with beetroot discs and the breast on top. The pickled elderberry is very strong and acidic, a little goes a long way. It pairs perfectly though with the strong gamey leg flavour, but slightly overpowered the delicate saltiness of the breast. 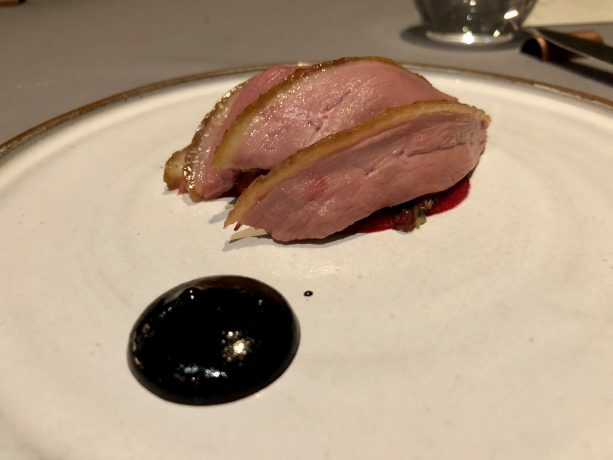 How well is that duck cooked tough, sublime! The first of the desserts and this little beauty was an absolute star. 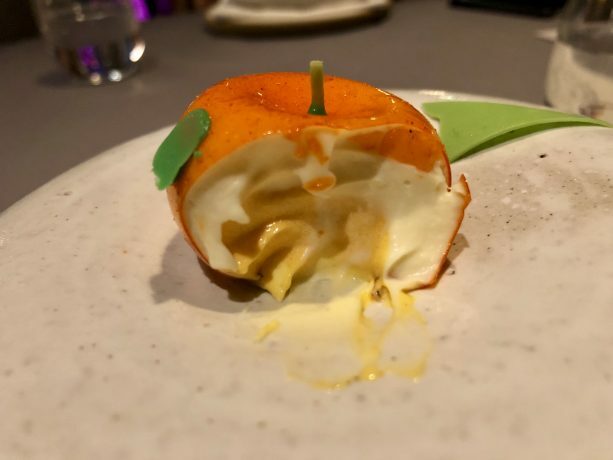 An orange sugar ball filled with white chocolate mousse and a sea buckthorn mousse. I would love Adam and his team to make full size orange ones of these. I cannot fault it in any shape or form. The sea buckthorn is quite tart, which cuts through all the sweetness and creaminess of the white chocolate mousse. The texture of the easy peeler shell again blew my mind. Everyone needs to try this. One of the best desserts I’ve ever eaten anywhere in the world. The second taster dessert sadly couldn’t live up to the former. 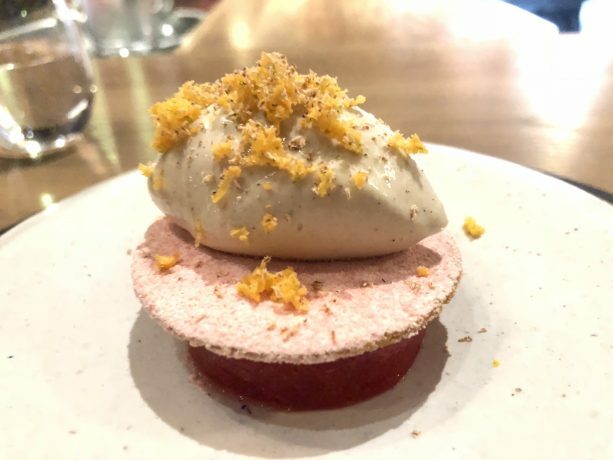 A rhubarb jelly, speculoos biscuit with rhubarb sherbert, malt ice cream, an orange zest butter and a grating of nutmeg. Sadly this just didn’t hit our taste buds. The rhubarb jelly is very sharp and nothing else counter acted it. I felt the nutmeg was really overpowering too. On to the star of the show. The Golden Empire. 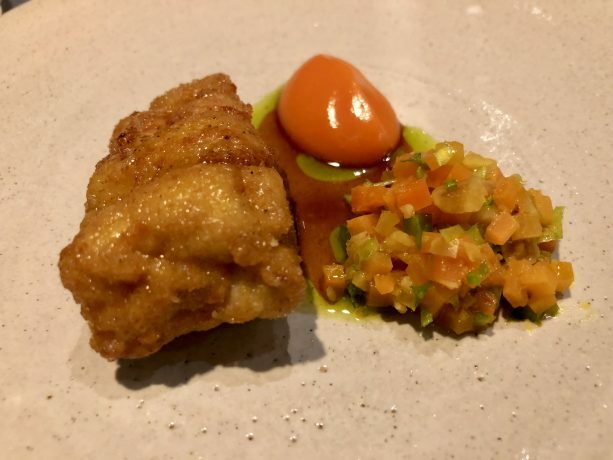 Adam Reids winning dish from the Great British Menu 2016 . Basically this is an apple crumble taken to new heights. I cannot stress the technical achievement of this dish. 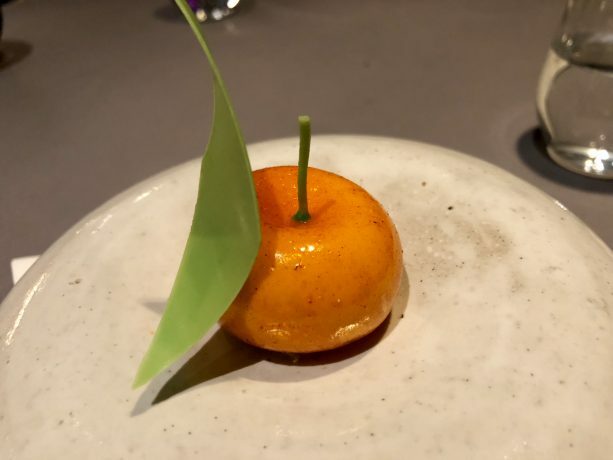 It is so difficult to make, that they still break several everyday whilst making them, as the pastry chef demonstrated while he was plating ours up. It is a sugar sphere, filled with a meadowsweet mousse then three different types of diced apples. 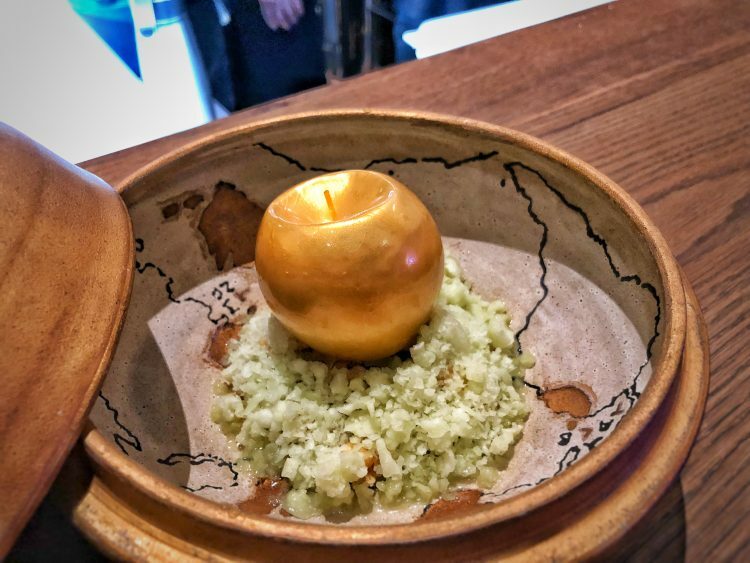 Placed on a bed of crumble and a granny smith snow poured around the outside. Absolutely bonkers. I can’t stress how impressed I am by the ability to make this. I must admit if I could master sugar blowing, maybe I could. That is a big ask though. This dessert has won many awards, and there is a reason it is still on the menu two years later. Adam has shown that desserts can be the star of a menu. 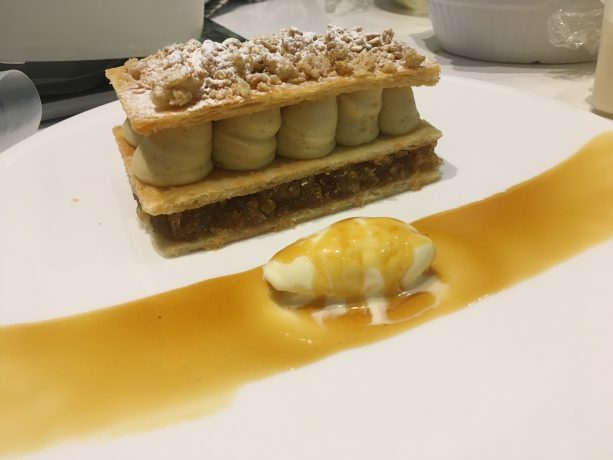 I love my apple crumble mille feuille dessert I made in the penultimate round of MasterChef this year, it really is apple crumble heaven. This dessert famously brought John Torode to tears! The bottom layer is caramelised apple puree with calvados. The cream layer is a creme patisserie heavy with nutmeg (so its like eating a custard tart), then my crumble on top. Served with an apple caramel sauce and clotted cream ice cream. Also homemade puff pastry, the reason being you can get more butter into homemade and hence make it taste better. I thought my dessert was complete smallfry compared to Adams. It is in terms of technical ability, but when it comes to the flavour, which is what i’m all about, I think it holds its own. I would actually love to have an apple crumble off with some of Manchesters finest chefs. I’m quite happy to put mine on the line. I’ve sent out a few feelers to see if we can make this happen. What an event that would be, just loads of apple crumbles for dinner! David, your food posts define what food beauty looks like. It’s like watching a beauty pageant of plated food. Just gorgeous and mouthwatering. Great post. I love fine dining and tasting menus. But I do think chefs have gotten carried away in the last 10 years or so with overdoing dishes. For you to have not tasted hazelnut and offal of some kind is just nuts. And truly what purpose does foam serve? It’s kind of sickening to me. Technical abilities is of much less importance to me. I don’t want to eat artwork. I want great food. You should read my post, The Taste of Central Otago, which is a cookbook I bought in New Zealand. You’ll get a kick out of it. Maybe I should send it to you!!! And finally, my virtual young friend, you are a damn good cook! Thank you Mimi. I’ll have a read. What a wonderful review, each word making me hungrier! The dishes look wonderful, the description of the flavours is excellent. The fruit glass looks absolutely awesome, it’s something I’ve wanted to try my hand at. I am hoping you will share you’re Reconstructed Apple Crumble recipe with us soon, I’d love to make it for an upcoming dinner party. Congratulations on how far you went with MC UK, what an accomplishment! Your consistent iron-strong composure around the most stressful competitions was impressive! JT and I watched every episode with baited breath while we were visiting friends in Arizona, stealing an hour away from them to watch each show. However, I am pleased that you’re back to blogging, we missed you. A well-deserved treat after your wonderful MasterChef UK performance. As you know, I am a big fan of your approach to cooking at home… with absolutely no desire whatsoever to put my efforts under the same public scrutiny! 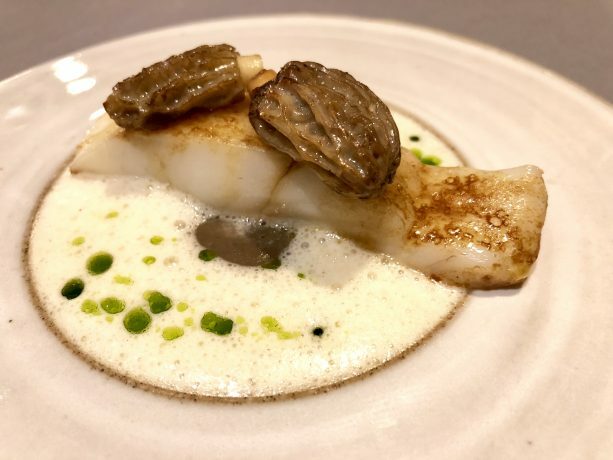 Dining out really needs to provide consistent delight and finish with something to remember but quite often even a professional kitchen will fall down in that respect. Of course, allowances must be made for personal tastes and just plain wrong choices made from a menu. But if you’ve cooked something really successfully at home (or in the MasterChef kitchen!) you’re likely to seek a comparison with a top chef’s interpretation of similar ingredients. Mr Torode was obviously taken (sniff) by your apple crumble and although I can’t taste the television pictures I’m pretty much convinced that it brought out all the right elements in abundance. Technique, refinement and restraint be damned. Sometimes stopping as soon as full-on flavour and texture is achieved is the best way. Nothing controversial in that! I know it’s been said before, but please accept one more request for your apple crumble recipe. As for that cookbook of yours. If it takes another year, will you please leave the great archive of recipes on this blog at least until then?! I’ll see what the people behind the scenes say, Geoff. Hi David, after watching Masterchef, I’m now following your blog. 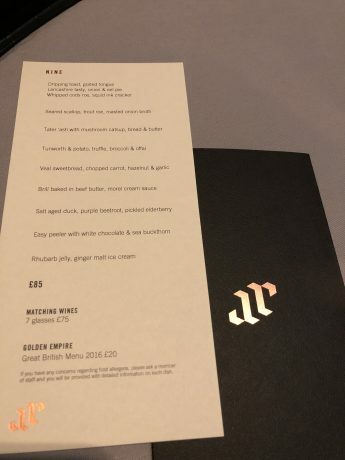 We have a great neighbourhood restaurant in Bath called Menu Gordon Jones which offers a fabulous tasting menu and wine flight to go with it. Come try it sometime!!! Thanks Debbie, hope Gordo was well!